What may be the best New Zealand food history book of recent times. This beautiful children’s book is full of information drawn from extensive research alongside evocative illustrations, released to coincide with the 250th anniversary of The Endeavour’s journey. Fascinating stuff recommended for foodies and picture book lovers alike. 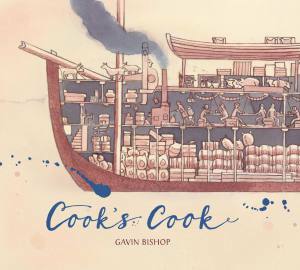 The creator of last year’s blockbuster Aotearoa comes up with a tasty history lesson in his culinary take on Captain Cook, through the eyes of John Thompson, his one-handed cook. 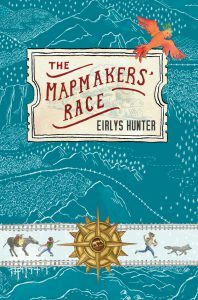 NZ Children’s Book Award winner Gavin Bishop illustrates this story with muted colours, giving them a historic feel. They are strong images, showing emotions and adventure. This book tells many stories with subtle humour and surprising happenings. It is a wonderful adventure and I read it from cover to cover in one sitting. I would highly recommend this book to almost anyone. A unique angle; a generous format and top-quality production standard; salient and high-interest details; succinct text and appealing illustrations—all these factors combine to make Cook’s Cook and essential and highly reccomended purchase. This is a short but surprisingly heavily -packed book. There may only be about 40-odd pages but everyone deserves a re-read, as there are many little jokes, facts or secrets hiding in the illustrations. Gavin Bishop has served up another meticulously researched and beautifully realised book that hooked me from start to finish. This book is historically informative, artistically pleasing, culinarily diverse and, frankly, a pleasure to explore. Any teacher from Year 3 upwards will find more than enough teaching points to keep their students, and themselves happy, as this one-armed cook cooks for Cook! Bishop’s rousing take on Thompson’s culinary exploits is liberally interlaced with attention to the ship’s overall mission. Ink and watercolor illustrations incorporate renderings of the action as well as vignettes, insets, and symbols that allude to concurrent views of the Endeavour’s adventures. Author Gavin Bishop lets his research shine as he writes this interesting story. It is illustrated throughout in muted blues and browns, giving the look of an old ship’s journal. Youngsters from third to sixth grade will find this a wonderful way to learn some fascinating history. I just had to get this fantastic book. 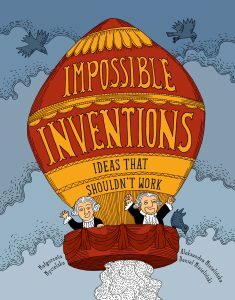 Just a fantastic non-fiction book. Details, facts and fantastic illustration. Great different perspective on Captain Cook’s voyage. What may be the best New Zealand food history book of recent times…It makes for a highly original and highly entertaining take on exploration, history and adventure and reminds us that Cook didn’t do it alone. Striking woodcut-style illustrations provide a glimpse into the ups and downs of seafaring life, and Thompson himself offers wry dialogue asides. A unique take on a historical voyage. Bishop’s style captures much of the nuances of late eighteenth-century cartoon beautifully painted in sepia and blue watercolour schemes, skewed angle speech bubbles, along with recipes, facts and information in scrolled and rope frames. 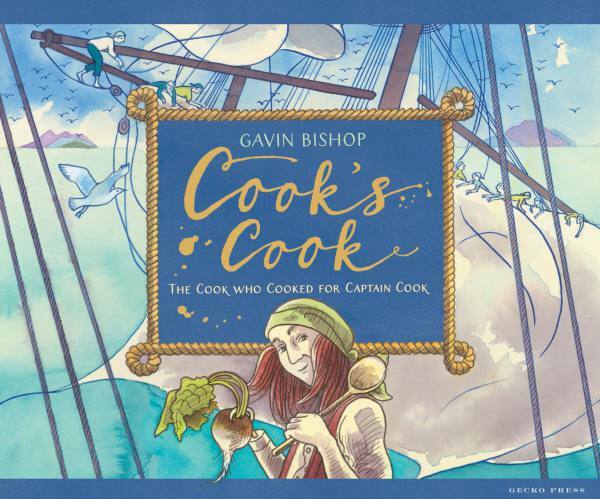 A feast of food, facts and history…Award-winning New Zealand illustrator Gavin Bishop sweeps young readers away to life on the ocean wave with famous explorer Captain James Cook in a fascinating, fact-packed picture book. This beautiful book is full of information drawn from extensive research alongside evocative illustrations, released to coincide with the 250th anniversary of the Endeavour’s journey.It really is something quite special and original, and if your children are similarly amazed by tales of the great explorers, this is absolutely essential.